This was seen on Thursday with strong public support for the soldiers, including from paramilitary groups photographed outside the military courthouse who showed up in force. Correction to the previous tweet: they are pro-Kopassus militia, the "Alliance Rejecting the Intervention of Human Rights Propaganda"
Supporters who were interviewed by Tempo praised the actions of Kopassus soldiers in cleaning up the city’s streets of preman, or ‘gangsters’. To give you an idea of the pro-soldier sentiment, the red banner in the middle reads ‘The people of Yogyakarta are ready to replace the 12 Kopassus warriors in prison’ (errors in translation mine). The idea of Hendro Priyono and others that Kopassus were carrying out a positive act appears to be echoed in these public displays. 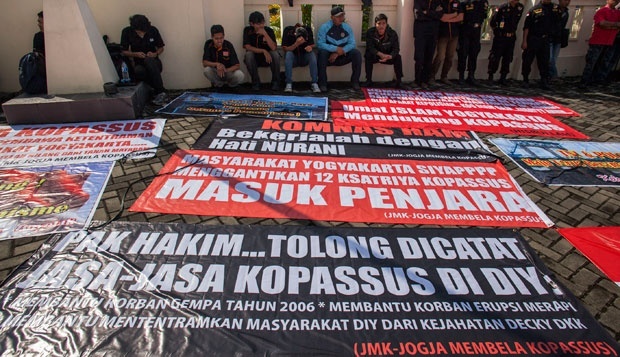 The black banner in the foreground implores the judge to consider the track record of Kopassus not only in providing rescue services during the 2006 earthquake and 2010 eruption of Mt Merapi but also helping to rid the city of the ‘crime of Decky and others’ (the detainees). But we shouldn’t be confused about who’s really on trial here. If there’s an ounce of credibility to the statements by Indonesia’s new Army Chief of changing military culture and improving professionalism, Kopassus simply cannot be celebrated as victors against preman-ism or victims of ‘human rights propaganda’. Human rights organisations, most notably Komnas HAM (Indonesia’s National Commission for Human Rights), have also called for military leaders in command of the soldiers and police in charge of prisoners’ welfare to be held accountable. 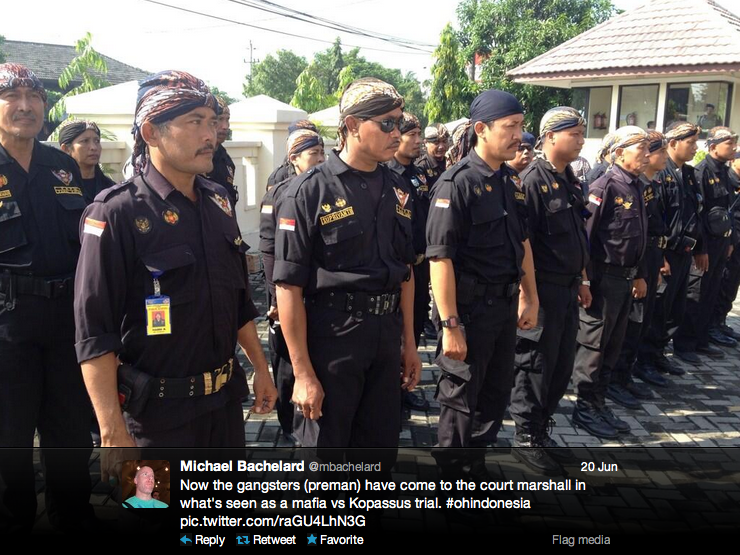 None of this is to suggest that Indonesia’s reform of its military has failed. There was a signal sent by the reassignment of Diponegoro Military District Command chief Major Geneneral Hardiono Saroso for stating all his soldiers, including the accused who were in his operational area, were at barracks the night of the killings (a statement he later retracted). But there’s still more to be done. Simply, the case highlights the importance of the TNI leadership at all levels in unequivocally committing to cultural change and publicly supporting the rule of law. Image sources: @MBachelard, @MBachelard and Tempo. 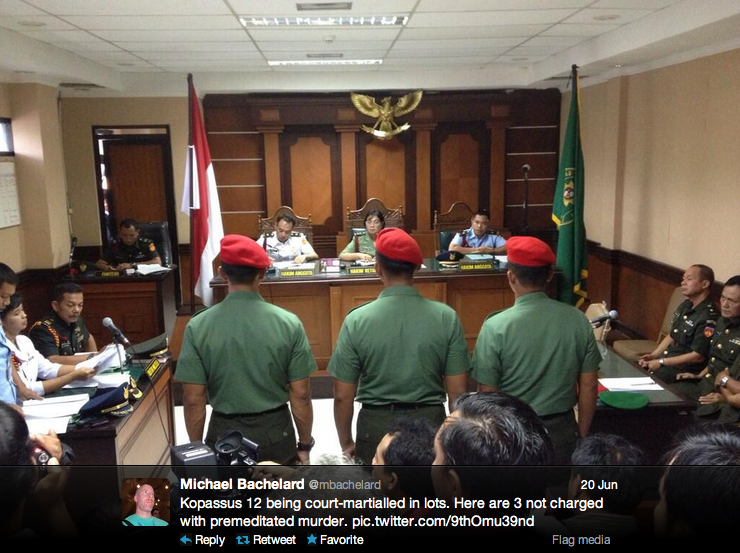 This entry was posted in Indonesia, Law Enforcement, TNI by Natalie Sambhi. Bookmark the permalink.